In celebration of Global Smurfs Day, June 14 the Sony Pictures Animation announced all-star cast of its new film “Get Smurfy”. Get Smurfy find Smurfette and her brothers exploring the hidden Enchanted Forest with the intention of finding a legendary Smurfs village before he does his nemesis, the evil sorcerer Gargamel. Along the way they come to light some mysteries of the origins of the little blue creatures: the Smurfs come in other colors ?, mushroom houses are organic? and ... why are 99 boys and only one girl? This is what we see in Get Smurfy, the new film from Sony Pictures Animation, which was announced on June 14 by the conclusion of the Global Smurfs Day. Demi Lovato multi-platinum winning artist, bring her voice to the powerful girl Smurfette; comedian nominated for an Emmy, Rainn Wilson (The Office, Monsters vs. Aliens) will voice evil Gargamel, the Smurfs arch enemy. In addition, Papa Smurf will be played by Mandy Patinkin (The Princess Bride, Homeland), winner of an Emmy. With its world premiere scheduled for March 31, 2017, the new animated film will be directed by Kelly Asbury (Shrek 2, Gnomeo & Juliet), produced by Jordan Kerner (Charlotte's Web, The Smurfs) and co-produced by Mary Ellen Bauder (Hotel Transylvania). 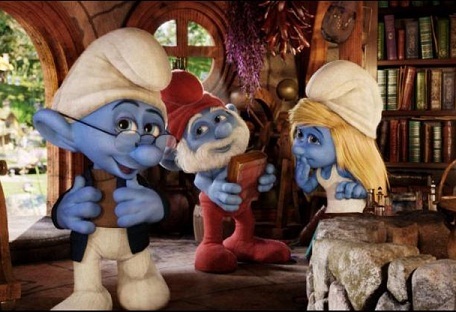 Get Smurfy represents a totally new film in Columbia Pictures franchise, which has grossed over $ 900 million globally. Director Kelly Asbury said "the enduring popularity of the Smurfs is evident, and this new world tour returns to the fully animated that shot." "We felt it was important to take a very different approach to this origin story. This film returns to the roots of the creation of Peyo in a fully computer-animated adventure. I hope you enjoy it just the fans, but also delight new viewers in all countries. We are excited about the talented cast we have in our new Smurf version!" Continued the producer Jordan Kerner. "We put together a group of filmmakers and artists who grew up with these adorable characters, so Get Smurfy will be imbued with the same adventurous spirit that made us lifelong fans of these little blue guys ... and girls," he said Kristine Belson, Sony Pictures Animation.